South Africa is the proud host of the 2010 Soccer World Cup, so we're expecting many visitors, and maybe you will be one of them. I thought it was appropriate to tell you a little bit more about a country that many people don't know that much about, but they should! Here are four "secrets" about South Africa, a country that Michelle* and I call home. In the desert-like Klein Karoo, just outside of Oudtshoorn, you will uncover a hidden treasure called the Cango Caves. These dripstone caverns, with their vast halls and towering formations, are regarded as one of South Africa's natural wonders. The Cango Caves were born from the geological fault in the Swartberg Mountains (known to the San as the Kango). It has taken hundreds of thousands of years to create the secret kingdom of carved caverns, corridors, and dripstone formations deep within the mountainside. You will find an assortment of elaborate formations resembling works of art, with visually appropriate names such as Organ Pipes. The Caves reminded me of a haunted house, so those who are easily spooked - beware! You are able to take tours through the caves, and there is even a crawling tour! South Africa is known as the Rainbow Nation because of the eclectic mix of cultures. There are restaurants representing many different countries. Hundreds of years ago, South Africa was settled by colonists from Portugal, the Netherlands, Germany, France, and the United Kingdom, who brought with them European cooking styles. Indians also made South Africa their home hundreds of years ago, and so Indian cuisine is extremely popular, with an Indian restaurant or two in practically every town. Durban is the place to go to experience the delights of this culinary style. Of course, there is the traditional style of cooking in terms of the African and Afrikaans styles. Potjiekos is an Afrikaans stew made of meat and vegetables and cooked over coals. A traditional South African dessert is an Afrikaans pudding called Melktert (Milk Tart), which is a sweet pastry crust filled with a creamy custard filling made from milk and sprinkled with cinnamon. My personal favorite is Malva Pudding, which is a sponge cake served hot with custard or ice cream (see "Christmas in South Africa", SDM, Dec '09). The Drakensberg Mountains form the highest mountain range in southern Africa. It is known as the "Dragon Mountains" and the "Barrier of Spears", and to South Africans, the "Berg". This 200 kilometre long world heritage site falls mainly in the province of KwaZulu-Natal. The Drakensberg Mountains are snowcapped in winter. This breathtaking wonderland presides over masses of bush, yellowwood forests, and cascading waterfalls. It is a favorite holiday destination. Simply stunning are the words that come to mind when describing the endless beaches found in South Africa. South Africa boasts the best and least crowded beaches in the world, from the delicious warm sea on the East Coast to the beautiful, yet icy sea on the West Coast. 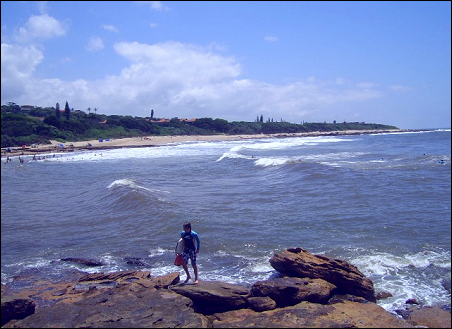 The coastline of KwaZulu-Natal is a tropical paradise, focused primarily on the beach lifestyle. From the holiday haven of Umhlanga to the vibey Margate, these beaches boast warm weather all year round, and a good dose of Zulu cultural history. Cape Town is known for the up-market Clifton Beach, where you may spot a local celebrity or two. Perhaps the unofficial nudist beach, Sandy Bay, is more your cup of tea. (You have been warned!) Going to the beach is one of my favorite things to do. I love the smell of the sea, and hearing the waves wash against the shore. I have many fond memories of holidays at the coast when I was a child. I know that no matter where I live in the world, I'll always be a South African girl at heart. 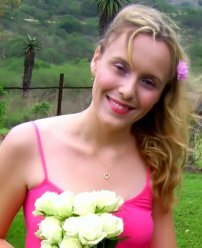 * Michelle, 16, from South Africa, also writes for Sweet Designs Magazine.